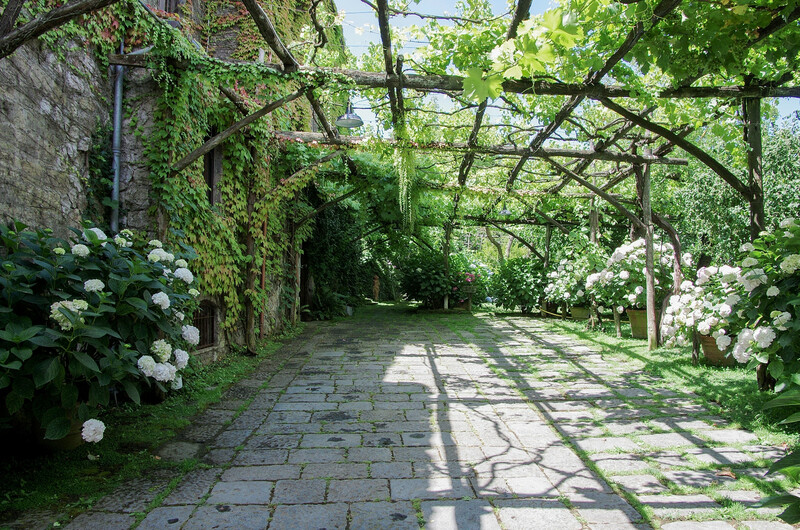 This magical villa – a 16th century farm built from volcanic stone – and its gardens have the unique, enchanted feel of a fairy tale but with modern living in mind. Sleeps 9. 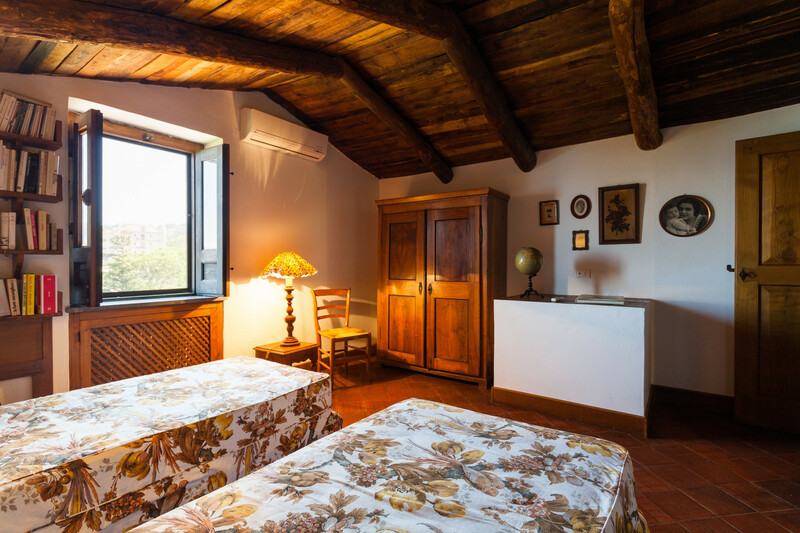 Villa Mellicata isn’t just a place to stay, it’s an experience in itself. Many of our visitors tell us they feel how loved the place is by the family, and the family extends this passion for their home to their guests. Over the years, the villa, mostly used as the owners’ summer residence, has hosted illustrious names from politics, arts and entertainment including Carla Fracci, the queen of Italian and international ballet; Alan Ford, former US president with Peter Secchia, American ambassador in Italy; and Claudia Cardinale, the Italian actress, and movie director Pasquale Squitieri. The villa is just off Il Nastro Verde – the green ribbon – road the runs from Sorrento to the village of Sant’Agata sui due Golfi. Hidden along a verdant track, you approach the house through a canopy of leaves and over stone cobbles. 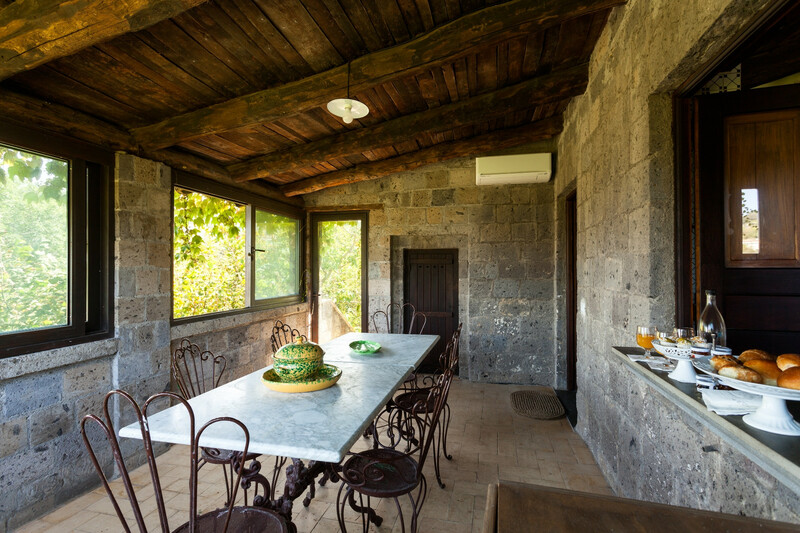 The house itself is built from volcanic rock and is smothered in vines. 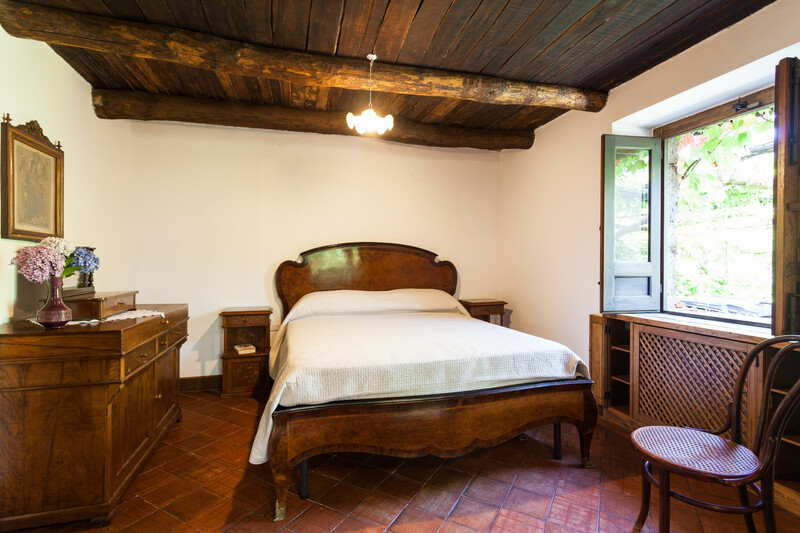 It has been lived in and loved by the farm’s family for many decades and this is expressed in its authentic Italian furniture, seasoned wooden ceiling and staircase and beautiful tiled floor which has a patina developed over many years’ footsteps. 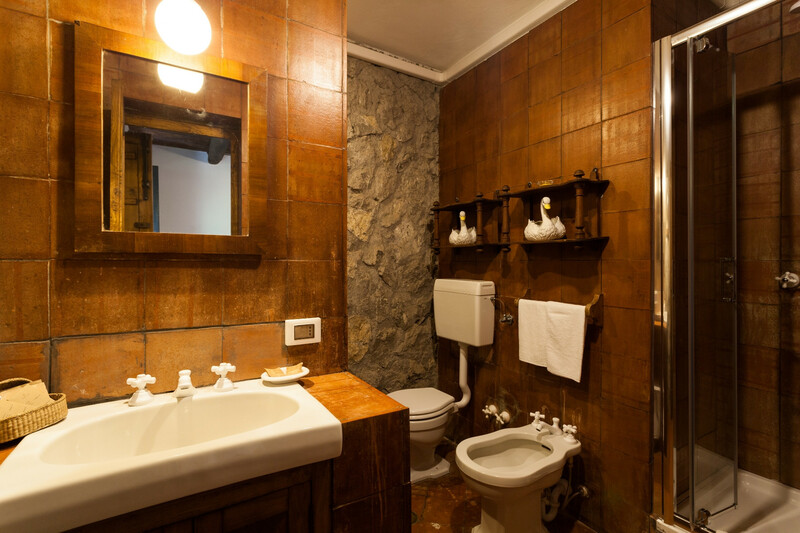 The house is kept immaculate by a cleaner who arrives every day to take care of the guests and the villa. 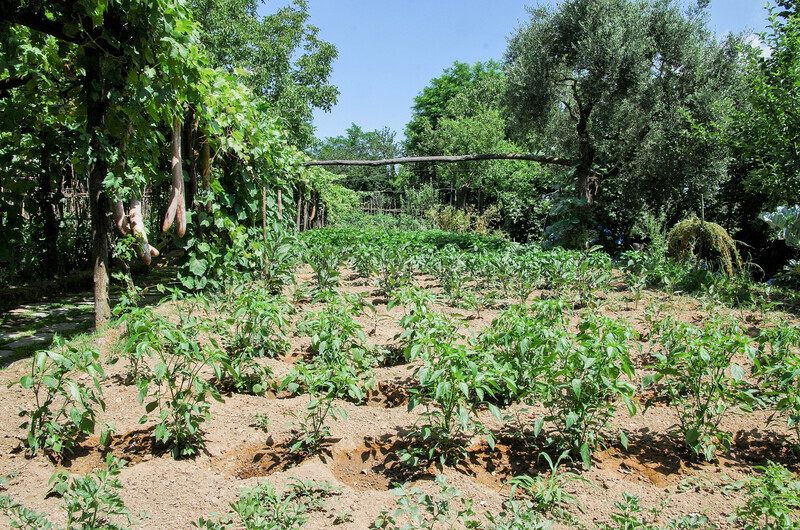 Signora Rosa owns the villa and is a gardener at heart; you will be treated to an abundance of organic farm produce ranging from fresh vegetables and fruit to herbs, nuts and eggs during your stay. Going hungry is not an option! 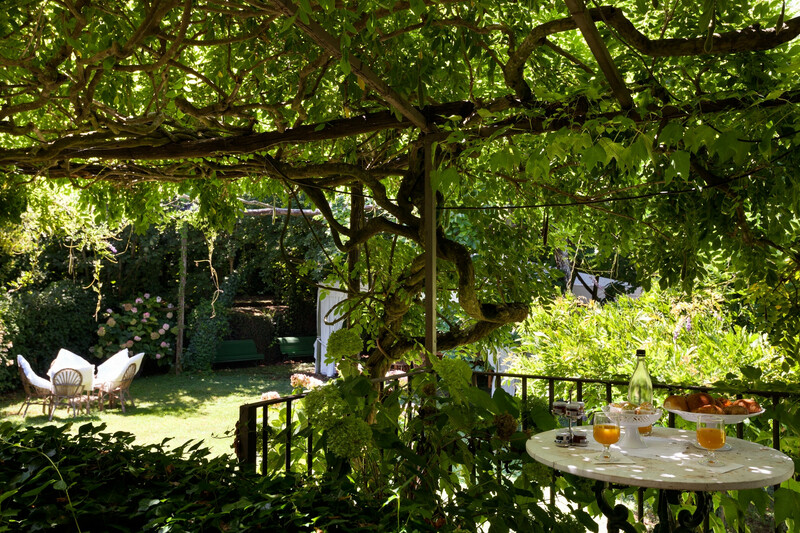 Signora Rosa and her gardener spend a lot of time taking care of the enchanting garden that surrounds the property. 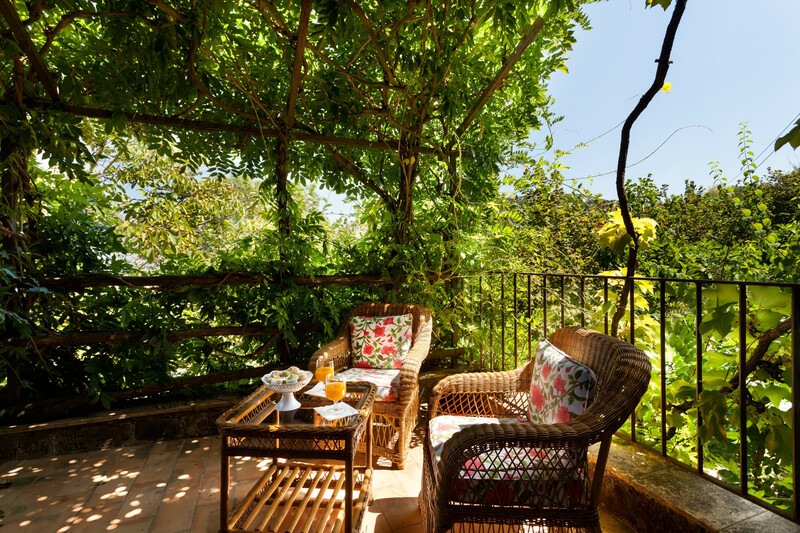 Villa Mellicata is part of the stunning Sorrento countryside and is perfect for walking holidays – if you can bear to leave the villa. There is no truck with blank minimalism here; this villa wears its history on its sleeve. 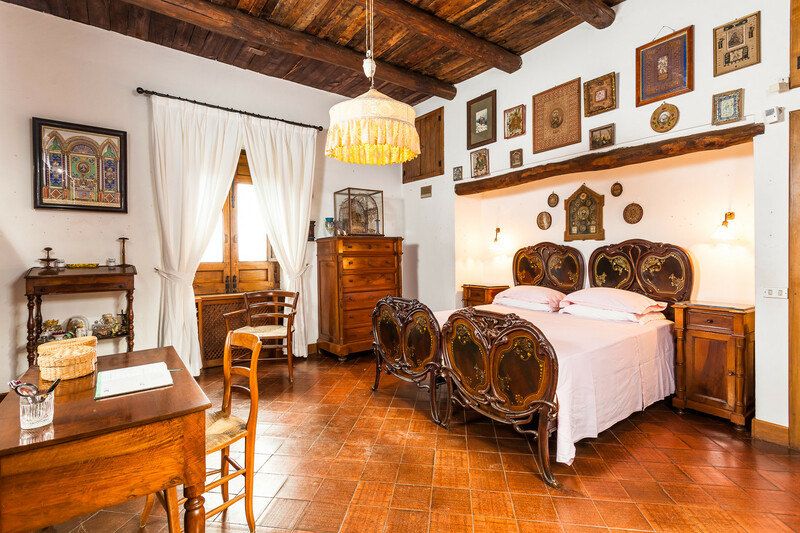 The walls are adorned with cherished photos and artwork; the furniture and paintings has been hand-picked by Signora Rosa and cared for with love. The whole place has a mystical feel as if you were in some traditional fairy tale. But let’s not get ahead of ourselves – the amenities are anything but mystical – plumbing, power, wifi, heating and the air-conditioning are thoroughly 21st century. The large living room is an elegant but cosy confusion of tailor-made Harrods sofas and armchairs at one end, with a charming dining table at the other.Through doors peep the inevitable greenery that characterises this villa. 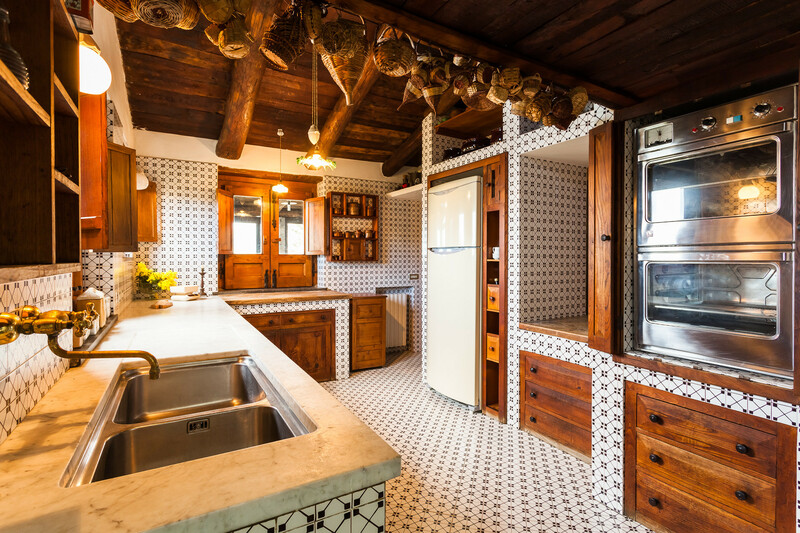 The kitchen is another homely space, many a bowl of pasta has been cooked up here. 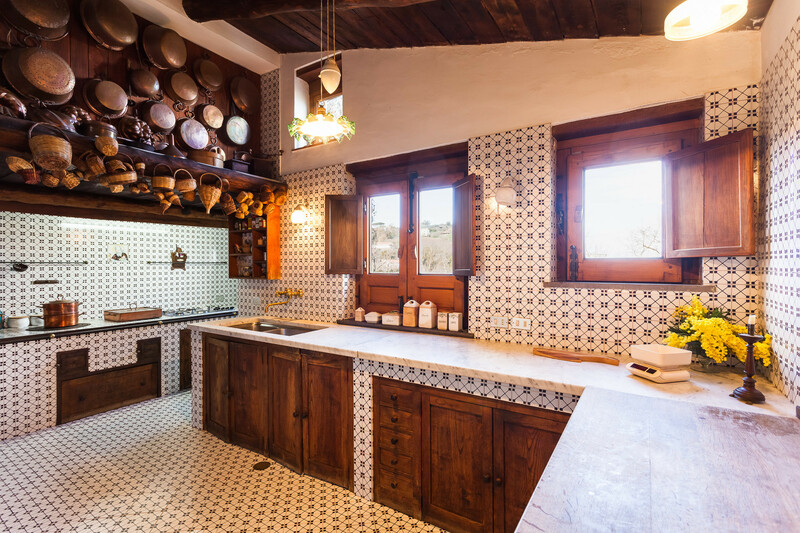 The tiles are gorgeous, the wood is lovely, the shining copper pans are enchanting; there is a wood stove, old-fashioned pots and baskets, but the Alpes Inox oven is an up-to-the-minute piece of kit, as are the hob, fridge-freezer, dishwasher and other appliances. This is a true cooks’ kitchen. Down below are wonderful old tuff rock vaulted cellars where you will find stocks of prestigious vintage wines and cured meats. 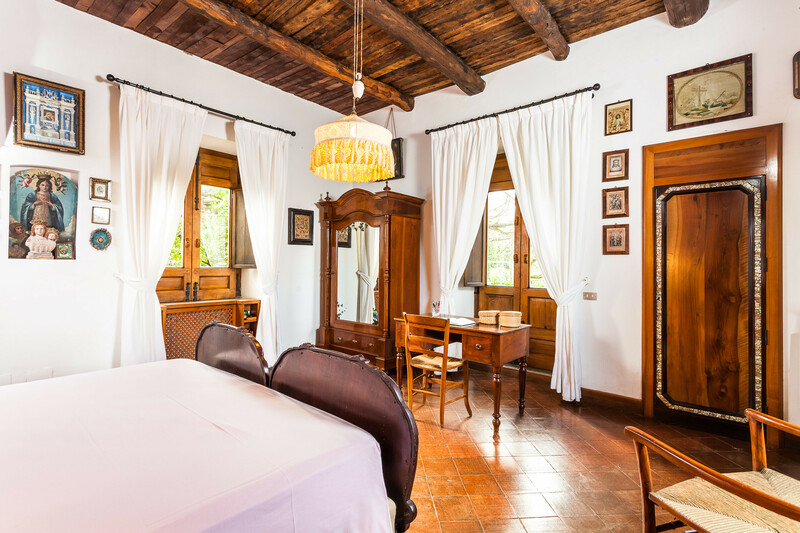 Each of the four bedrooms has its own character – from the whimsical twin room with a pretty pink sofa bed and iron bedsteads to the exuberant double with wood-framed pictures all over the walls and amazing furniture. 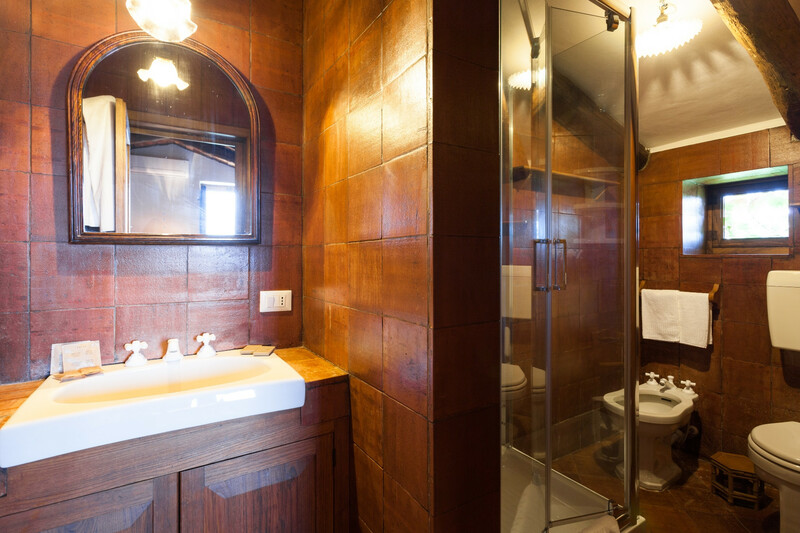 All the bedrooms have windows looking out onto the gardens or over the hills, plenty of storage and each has its own bathroom – these are fitted in an almost art deco, dark wood style and have modern showers and bath. The grounds of Villa Mellicata are extensive and a riot of green; the drive and parking spaces are enclosed by trees and bushes to the side and overhead with vines; the main lawn has a large pergola for outside dining; there are shady roof terraces that give stunning views over the hills; there are quiet nooks to inspect the ornamental plants chosen carefully by Signora Rosa. 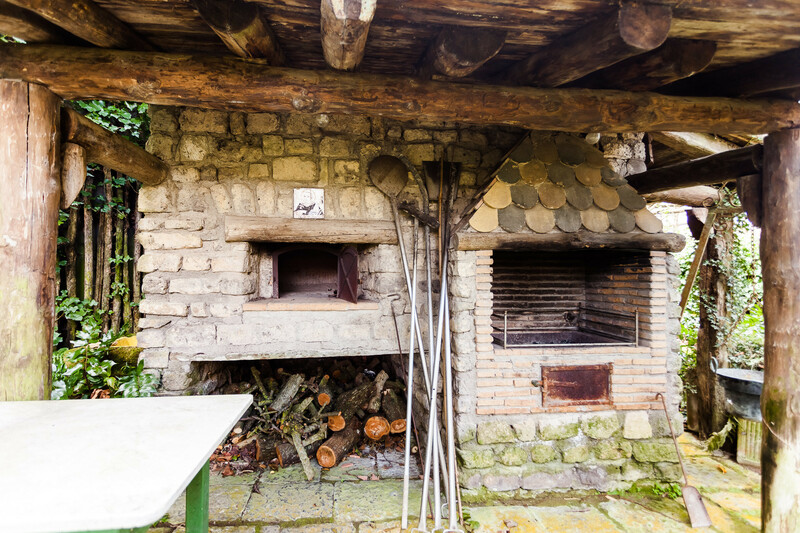 Enjoy a walk through the lemon and olive groves or under the walnut trees; gather for pizza or a barbecue at the outdoor kitchen. Children and adults alike will be delighted at the stone-built playhouse with its own balcony and roof terrace, and by the charming treehouse. At the edge of the property is a swimming pool surrounded by loungers. The hilltop village of Sant’Agata sui Due Golfi is short walk away and has spectacular views over the Bay of Naples on one side and the Bay of Salerno on the other. It is home to a supermarket and several good restaurants, including the 2 Michelin-starred Don Alfonso. The town of Massa Lubrense – known as the ‘Land of the Sirens’ is 7 km away on the coast, with scenic, pastel-painted houses perched on the cliffs and boats in the small harbour. The town offers plenty of shopping, eateries and bars, as well as interesting cathedrals and other attractions. 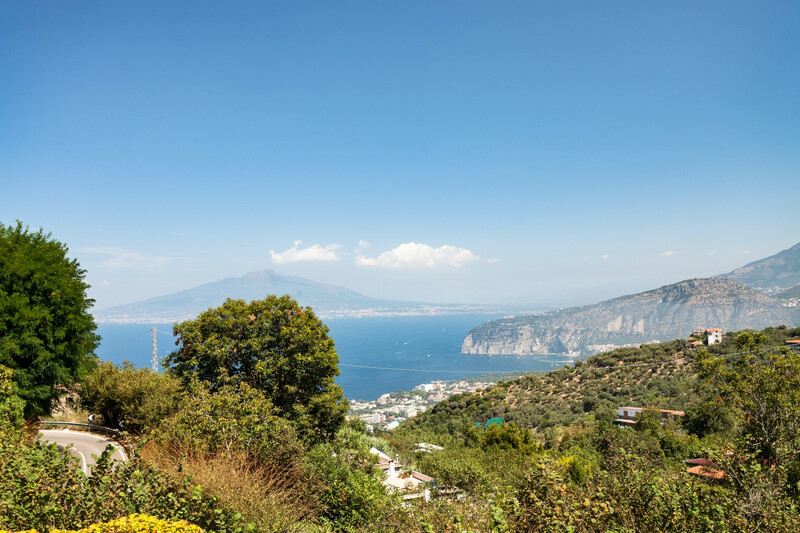 Sorrento is a windy 9 km drive away with its narrow, cobbled streets, splendid piazzas and beautiful views over the water to Naples and Mt Vesuvius. Positano, Vesusius, Naples, Amalfi and Capri are just some of the places to explore from Villa Mellicata. 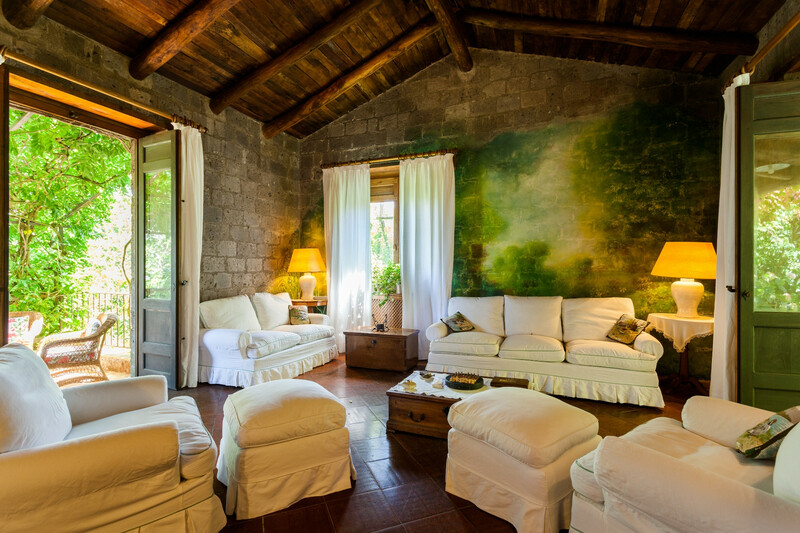 This villa will have you enchanted throughout your visit – whether by the magical gardens and its delicious produce, the wonderful family and their beautifully kept house, or by the views and the peace and quiet – you will have enjoyed an authentic Italian experience like no other. 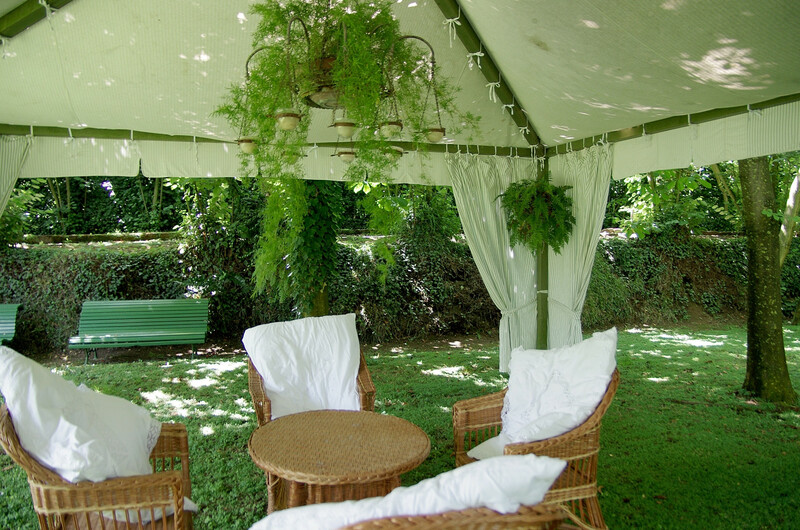 Villa Mellicata is a fantastic venue for a small wedding, baptism or other event. The experienced Feeling Italy team will be delighted to help make all your dreams come true! Contact us before booking to discuss what you would like, and we will quote you a price for the arrangements. Please note that from 1st April to 30 October, the Municipality of Massa Lubrense applies a mandatory tax to temporary residents of €1.50 Euros per adult, per night which must be paid in cash on arrival. 4 Double beds, 1 Single bed. 4 Bathrooms with shower, Hair dryer. TV Satellite, garden, garden furniture, fenced garden, terrace, barbecue, iron, internet (Wi-Fi), hair dryer, 300 m² property, 9,700 m² plot, central heating, air-conditioned, Open-air parking (3 places) in the same building. It right out of a storybook! Magical.